You will learn fundamentals like IP, TCP, DNS and SSL by using working Python programs; you will also be able to familiarize yourself with infrastructure components like memcached and message queues. You can also delve into network server designs, and compare threaded approaches with asynchronous event-based solutions. But the biggest change is this edition's expanded treatment of the web. The HTTP protocol is covered in extensive detail, with each feature accompanied by sample Python code. You can use your HTTP protocol expertise by studying an entire chapter on screen scraping and you can then test lxml and BeautifulSoup against a real-world web site. The chapter on web application programming now covers both the WSGI standard for component interoperability, as well as modern web frameworks like Django. Finally, all of the old favorites from the first edition are back: E-mail protocols like SMTP, POP, and IMAP get full treatment, as does XML-RPC. You can still learn how to code Python network programs using the Telnet and FTP protocols, but you are likely to appreciate the power of more modern alternatives like the paramiko SSH2 library. 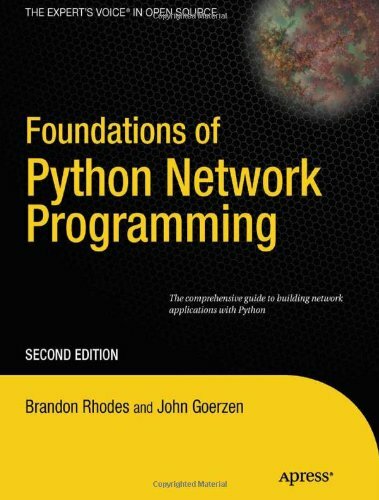 If you are a Python programmer who needs to learn the network, this is the book that you want by your side. This book will be of interest to python programmers who need to program networked applications using Python. From web application developers, to systems integrators, to system administrators—this book has everything you need to know.